This is the official “finished” post, and I’m really happy with how this came out. It actually came out looking just like the picture I had in my head. I do have to thank my lovely boyfriend for suggesting the Castle Grounds for the photoshoot, and for being willing to troll around taking photos of me, and for being a proper artist who knows about composition and colour and light and stuff like that. And since it was quite hard to stop him taking photos once he got started, this is quite a picture-intensive post! Fabric: purple cotton drill- £6.00, patterned cotton from stash, I only used a tiny bit of it to cut out the appliqués, so I’m calling this free. Notions: zip- 80p, cotton pearl embroidery thread- £4.05. hem binding- £1.50. Edited to add- a bit of interfacing from stash- I’m counting that as free. Sadly, although I was using one of the notions (the purple tape measure) to help make this when I was cutting out, there’s nothing concrete from the pattern & notions swap in the fabric of this skirt. Pantone Challenge colors: main colour: Acai, slightly pastelled down. Accent colours in the appliqués: Emerald, Koi, even a touch of Vivacious. Pattern:McCalls 3830. I’ve used this twice before so I’m counting it as zero cost. Time to complete: A couple of hours for the basic skirt, what seemed like an eternity (but is actually more like 13 hours) for applying and embroidering the appliqués! First worn: On Sunday. And again Tuesday. 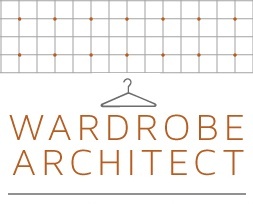 Wear again? : Definitely! It fits so well in with my existing wardrobe. 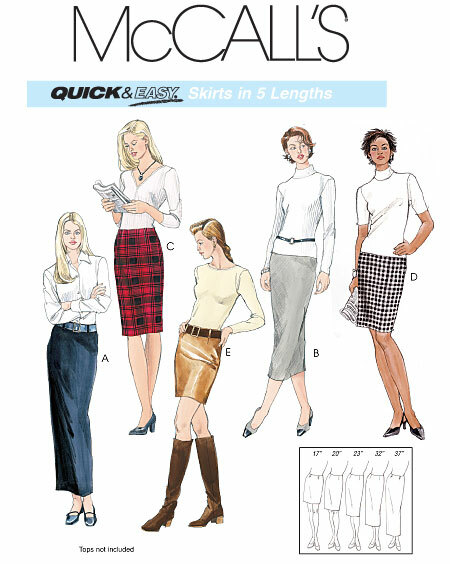 The pattern is my faithful McCalls straight skirt- it’s dead simple, it’s just a plain straight skirt. I went for mid-way between views C & D, so it’s on the knee. I did start by trying to make it a bit more A-line, by angling the side seams out, but it didn’t look right, so I cut them back to straight again. So essentially, I stuck to the pattern. I suspect I didn’t start the angling of the sides high up enough, I’ll know better next time I try it. The whole appliqué business. I’d decided from the off that I wanted to have a plain skirt that was embellished in some way, and when I found the accent fabric in my pitifully small stash, and the colours were so damn perfect for the challenge palette, as well as for my base fabric colour, it was self-evident to me that it would be cut-out shapes from the accent fabric appliquéd to the plain skirt. I might use different techniques another time, but I like what I did with it here. 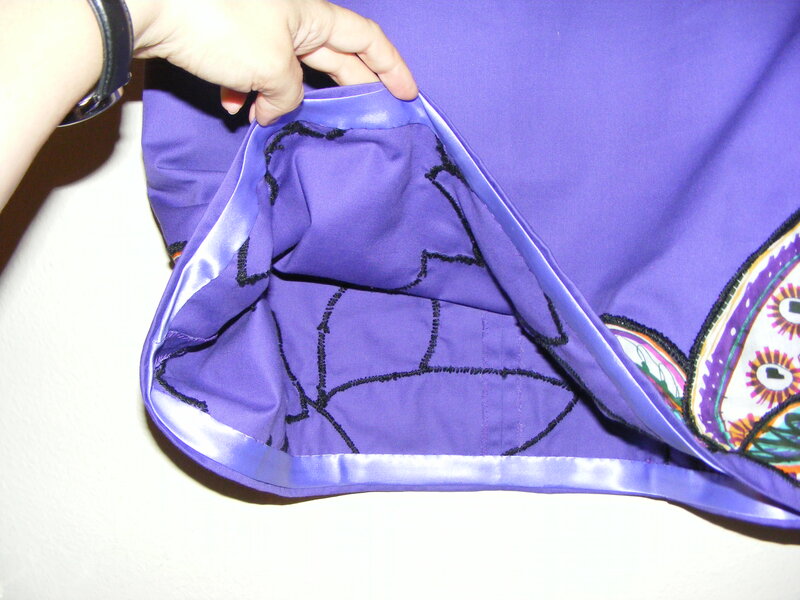 Basically, I cut shapes out from the accent fabric, tacked them onto the skirt, then used a rough satin stitch with black cotton perlé embroidery thread to fix them in place more permanently. 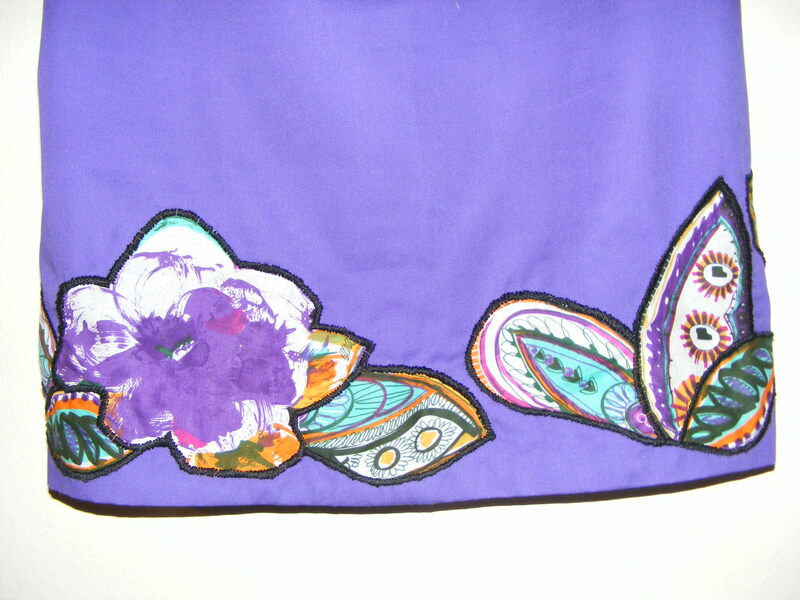 The black embroidery gives the shapes clear definition, and adds a bit of texture to the skirt. Appliqué Detail- that black line at the bottom of the skirt is shadow, not an edging! I also did a bound hem for the first time, which I think is really pretty and I’ll be doing again. I used a lilac satin bias binding, and it feels lovely on my legs! The zip just would not behave! * It took four goes, and its still not one of my better zip insertions, but khalas, it’s done. Having got started on the appliqué embroidery, I was overwhelmed by panic that it would take forever to do, and that I wouldn’t have enough supplies of embroidery cotton. I had visions of having to photograph the skirt only from the front because that was the only bit that I’d finished! Here, have a back view photo, to prove that I did complete the embroidery all the way round! I did zig-zags to finish the seams, and it’s just not as nice as turning & sewing, or adding a proper binding. So it’s not as pretty on the inside as I’d like. Lesson learned for next time- finish the seams more nicely. The colour! I love love love the purple, and I also love that I’m wearing a colour that I’ve avoided like the plague for years, albeit in homeopathically small quantities and well away from my face- I’m not stupid! I also do love the appliqués with quite a passion, and I will definitely be doing something like this again. 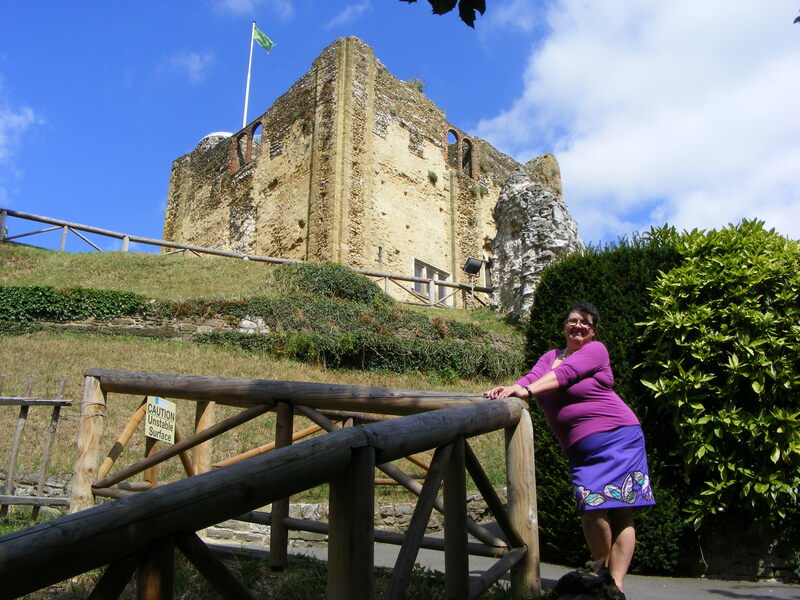 And since I have lots of photos of me up by the Castle, here’s a few more. It’s been fun sewing this skirt, and you can check back over my earlier posts about this skirt using the “the You Mean I’m Wearing Orange? !” tag in the list over on the right there. I loved the colour challenge, and I’m SO looking forward to seeing everyone else’s creations all together. 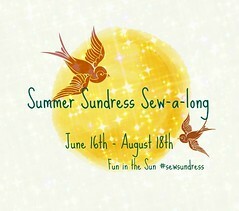 But the main thing this Challenge has taught me is that all those Sew Weekly Contributors were INSANELY productive!!! This skirt (a measly straight skirt for heaven’s sake, it’s not exactly ambitious!) took me two pretty intense weeks** to make (and a third week to get photographed nicely), and I was getting all panicky and stressed over it. The Sew Weekly contributors were making far more complex and amazing outfits in just one week, routinely, and taking it in their stride. 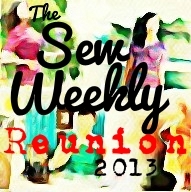 Kudos to you all, Sew Weekly people- I salute your work! 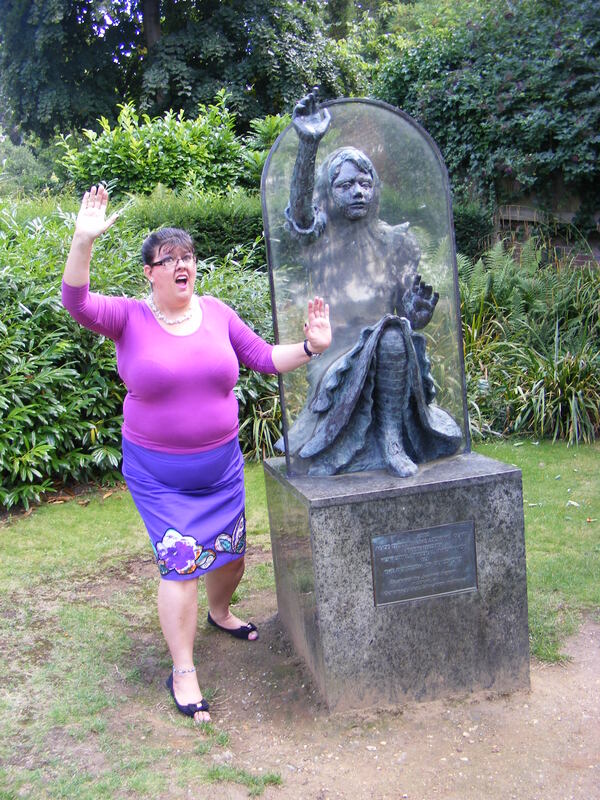 And finally, because there always has to be *one* goofy shot, here’s the Alice Through the Looking Glass statue, because Lewis Carroll died in Guildford, because he stayed with his sisters who lived here, when he wasn’t at Oxford. * It was all my own fault, not the poor zip’s. ** Well, to be honest, more like one easy messing-about week and one intense, stressy, panicky week. Oh wow!!!!!! This is stunning Bea! Your applique is gorgeous. I love the colours & it looks like you’ve put in such a lot of care & attention to detail – with the ultimate result. Super skirt! Thanks Winnie!!! It’s been fun to make. 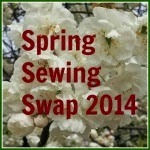 This is my first go at any sort of blog sewing challenge, and I’m hooked! Great appliqué Bea. I really like how you finished the hem with that ribbon! And thanks for the heads up on McCalls 3830. You look happy and the scenery is fabulous. Can’t wait to see what you make for the Sept challenge. Thanks Michelle! It was a beautiful day and I was having a nice time with my BF, so of course I was happy! Though I fear the September photos may not be quite so scenic- it’s not going to stay sunny for much longer here in England. Thanks Jacq- I’m learning to appreciate how useful TNT patterns are! I have that skirt pattern! Now I might just have to put it to use. Very lovely skirt! P.S. I’m a sucker for photos of people standing next to statues, posing in the same way as the statue. Cracks me up everytime. Looks like you had fun! It’s a pretty classic pattern. It’s nothing fancy, but very useful. Thanks for your kind words! My boyfriend was a bit shocked when I insisted on doing that shot- he thought I should be taking it much more seriously! Your skirt is lovely. The appliques are phenomenal. I did my first bound hem for my skirt too. Aren’t they lovely? I’ll have to try satin next time. Thanks! I’ve decided that sooner or later, I’m going to have to learn how to make my own bias binding. But I’ve got plenty in store, ready for the next couple of projects, so that will have to wait a little while. Thanks Amanda! I had fun with the appliqués and I’m definitely going to be playing with them again. I would like to have a go now. Did you use bonding fabric? I bought some a while ago to use, but was not sure how! No, I knew I was going to use the satin stitch over all the rough edges, so I didn’t think I’d need anything extra. I didn’t even know there was such a thing as bonding fabric till you mentioned it! I just cut out the pieces from the accent fabric, positioned them in place, pinned and tacked them, then added the satin stitching to cover the rough edges. Beautiful skirt! The applique really ups it a notch to fabulous level. And, the colour is great! Thanks Catja! I’m trying to build up a good me-made work wardrobe, so I needed to make the skirt sensible enough for that, but decorative enough to feed my soul! I love the way you’ve used this technique – not something I’d seriously considered trying until now. A lovely colour fabric too – I hope you get a few more wears out of it in the sun before we have to resign ourselves to the encroaching grey winter. Thanks Rose- I wanted to do something a bit special for the Sew Weekly Reunion challenge, and I was really happy that it turned out the way I’d pictured it in my head. It’s had a few wears now, and usually gets compliments, which any sewist would appreciate! Now where’s that Indian Summer they were promising us?